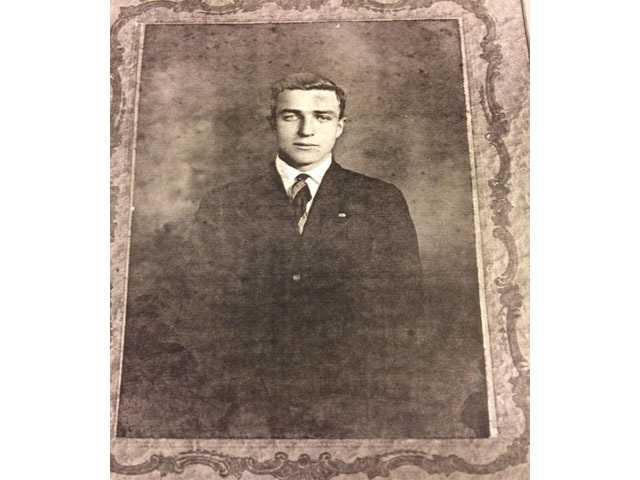 Diane Lazarus and Mihai Tripp, journalism students at Southern Connecticut State University, reported this story in 2016 as part of Journalism Capstone coursework on World War I.
Torrington resident Paul Maynard lived to see the last day of World War I, but died before it ended. The timing of his death has elevated Maynard to media attention through the years. 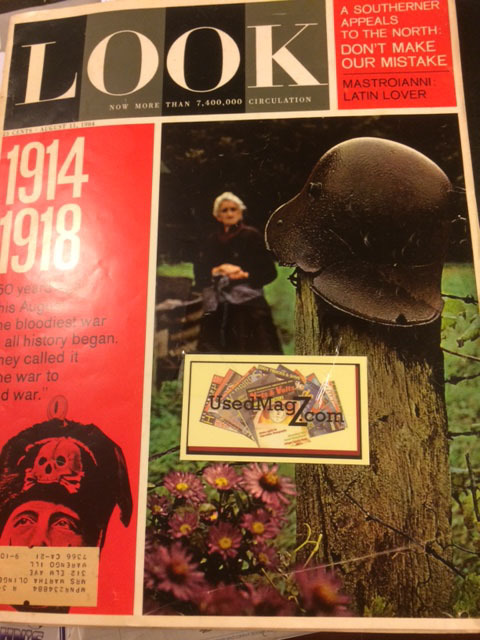 Look magazine spotlighted Maynard’s grave marker in a military cemetery in Europe for the 50th anniversary remembrance of the war in 1964. In 2015, the American Battle Monuments Commission released a 24-minute documentary about the war, with Maynard illustrating the average soldier’s experiences. Maynard enlisted in the National Guard at 20, leaving his parents and younger brother at their farm. He was a machinist in 102nd Infantry Regiment of the 26th Division. Letters home tell of Maynard’s struggles as a young patriotic soldier in the war. Guilford resident Rick Maynard and his sister discovered about 40 of Paul Maynard’s letters in 2010, when they were cleaning out their father’s basement. Paul Maynard had written home to his brother, their grandfather. “I’ve read all of them and as reading through them I was thinking that was pretty amazing, the stuff he was writing about and the experiences he had on the battlefield,” said Rick Maynard. Paul Maynard wrote about his experiences at war in an honest way. Maynard also wrote letters indicating he missed his loved ones and his life back home in Connecticut. Today Paul Maynard is included in Torrington Veterans War Memorial. He is listed on two sides of the Company M, 1917 Monument, and World War I Dead Plaque. 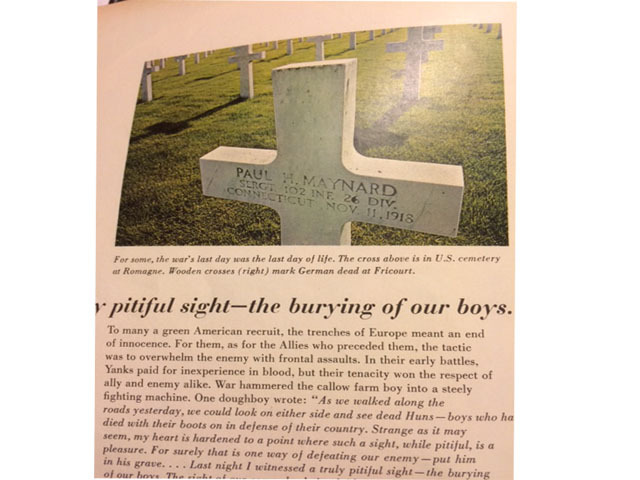 Paul Maynard fought in some of the war’s most notable battles in France including Battle of Belleau Wood, the Saint-Mihiel Campaign, and the Meuse-Argonne Offensive. Paul is buried in the Meuse-Argonne American Cemetery, Plot D Row 24, Grave 26. That is where the Look magazine picture was taken. Seeing that photograph was the first time Rick Maynard became aware his great uncle had died in the war. Rick Maynard has been speaking to groups about his great uncle in connection with the 100th anniversary of the war. Edited by Southern Connecticut State University professors Cindy Simoneau and Jodie Mozdzer Gil.